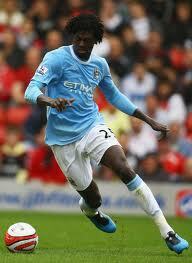 Real Madrid have renewed their interest in Manchester City striker Emmanuel Adebayor. Senior officials from the Spanish giants have reportedly made contact with the Blues over the possibility of a six-month loan deal with a view to a permanent deal. Real boss Jose Mourinho said he did not expect to sign any strikers earlier this month, but on Wednesday Argentina forward Gonzalo Higuain was ruled out for four months with a back injury. Tottenham, Fulham and Monaco are all keeping an eye on the situation. Adebayor has started just two league games for the Blues this season and last month was involved in a training ground bust up with Kolo Toure.